Below is a set of 32 photos with descriptions to accompany a walking tour of the historic DuPont and Kalorama Districts in Washington DC, starting from DuPont Circle. The photos show notable buildings and landmarks in the two districts, mostly drawn from the National Register of Historic Places. The walk is about 5 miles and will take at least 2 hours. Except for a brief stretch of dirt path in Rock Creek Park, the surface is pavement and sidewalks throughout, with lots of changes in elevation. A Google map of the route is located online here, and a link to a pdf map you can download and print out to take with you during the tour is here. 1. DuPont Circle, at 19th and P Street NW in Washington DC,was built in 1871 and named for Rear Admiral Samuel Francis DuPont. The current fountain was erected in 1921 and was designed by Daniel Chester French, who also designed the statue of Lincoln at the Lincoln Memorial. Figures representing the Sea, the Stars and the Wind are carved on the fountain’s central shaft. 2. The Christian Heurich House, at 1307 New Hampshire Ave NW, was the home of German immigrant and brewer Christian Heurich, and was built in 1892-94 by architect John Granville Meyers. 3. Second Empire Rowhouses. The north side of the 2000 block of N Street features some of the finest Second Empire rowhouses in the district, built during 1879-81 by Christopher Thom. The style was most popular during 1865-80, and usually features a rectangular tower or similar element with a steep mansard roof, reflecting the style’s French roots. 4. The James Blaine Mansion, at 2000 Massachusetts Ave NW, is a Queen Anne style house built in 1881 by architect John Fraser for James G. Blaine. It is the only surviving example of large mansions built during the late 1800s that once ringed Dupont Circle. George Westinghouse bought the home in 1901, and lived there until his death in 1914. 5. The Anderson House, at 2118 Massachusetts Ave NW, is a Beaux-Arts style house built in 1902-5 for Larz Anderson, an American diplomat, and his wife, Isabel Weld Perkins, an author and American Red Cross volunteer. The house is the headquarters of the Society of the Cincinnati, an historical, hereditary lineage organization with branches in the United States and France, founded in 1783 to preserve the ideals and fellowship of the American Revolutionary War officers. 6. The Cosmos Club, at 2121 Massachusetts Ave NW, is a private social club founded by John Wesley Powell , a noted soldier, geologist and explorer, in 1878. Cosmos Club members have included three US presidents, two vice presidents, a dozen Supreme Court justices, 32 Nobel Prize winners, 56 Pulitzer Prize winners and 45 recipients of the Presidential Medal of Freedom. The house was designed in the Beaux Arts French style by architects Carrère and Hastings in 1898 and completed in 1901. 7. Dumbarton Bridge, AKA Q Street Bridge or Buffalo Bridge, is a masonry arch bridge designed by architect Glenn Brown and built in 1914-15. The bridge is famed for its four buffalo sculptures by Alexander Phimister Proctor. 8. The Ellis House, a Beaux-Arts style mansion at 1607 23rd St NW, was built in 1907 by the prominent architecture firm Carrère and Hastings of New York. It was originally the home of Manhattan attorney Frank Ellis and became home of the Embassy of Romania in 1921. 9. The Edward H. Everett House, at 1606 23rd St NW, is a Beaux-Arts style mansion designed by George Oakley Totten, Jr. and built from 1910-14. It is currently the home of the Turkish Ambassador. 10. The Sheridan Statue, in Sheridan Circle, is an equestrian statue of General Philip Sheridan designed by Danish-American sculptor Gutzdom Borglum and dedicated in 1908. Borglum is also noted as the designer of Mount Rushmore and Stone Mountain. 11. 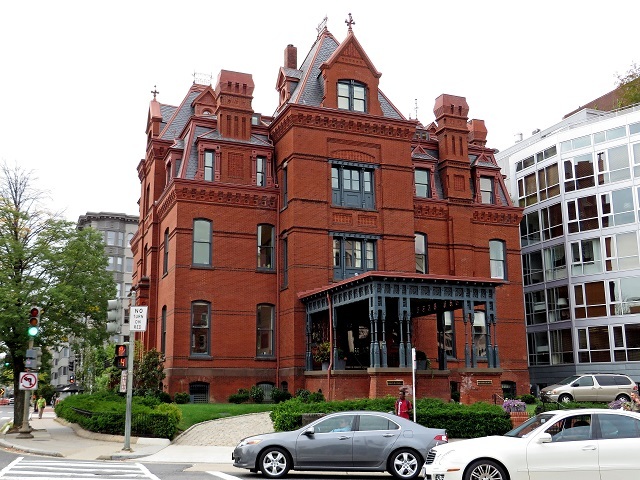 The Joseph Beale House, at 2301 Massachusetts Ave NW, is a Romanesque Revival built during 1907-9 for Mr. and Mrs. Joseph Beale. The architect, Glenn Brown, designed several buildings along Massachusetts Avenue and Dumbarton Bridge, at stop 7 on this tour. The house is now the Embassy of the Arab Republic of Egypt. 12. The Francis B. Moran House, at 2315 Massachusetts Ave NW, was built for Mrs. F. B. Moran in 1909 by architect George Oakley Totten, Jr. The stucco building features conglomerate 18th-century, limestone and terra-cotta details. 13. Saint Jerome is best known as the first translator of the Bible from Greek and Hebrew into Latin. His edition of the Bible, the Vulgate, is still an important text of the Roman Catholic Church. 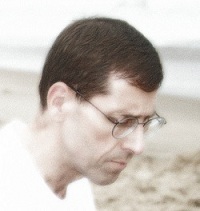 He was born c. 347 at Strido, in modern day Croatia. 14. Spanish Steps. A pedestrian connector from S Street to Decatur Place, formally named Decatur Terrace Steps and Fountain in 1911, but known today as the Spanish Steps. 15. The Wilson House, at 2340 S St NW, was designed by architect Waddy Butler Wood and completed in 1915. It is a Georgian Revival House with Adamesque interiors, and was occupied by President and Mrs. Wilson after his presidency. The Wilson House website is here. 16. The Emmet Statue, at Massachusetts Avenue and 24th St NW, is a bronze statue of Robert Emmet, an Irish Nationalist executed in 1803 for treason. The statue was designed by Irish sculptor Jerome Connor and dedicated by President Woodrow Wilson in 1917. 17. The Perry Lions guard Taft Bridge, two on each end, and were sculpted by Roland H. Perry, the designer of The Court of Neptune fountains on the Library of Congress Building, and installed in 1907. Despite partial restoration in 1964, the lions deteriorated beyond repair during storage for a 1993 restoration of the bridge. Today’s lions were recreated in 2000 using molds based on the original sculptures. The bronze lions at the entrance to the National Zoo were cast from these same molds in 2002. 18. William Howard Taft Bridge, AKA Connecticut Avenue Bridge, is a Classical Revival bridge built between 1897–1907. It is a 274.5 meter long arch bridge with unreinforced concrete arches and a reinforced concrete deck, the largest unreinforced concrete structure in the world. In 1931, the bridge was renamed in honor of US President William Howard Taft. 19. The Bairstow Eagles, a series of 24 lampposts, are equally spaced along both sides of Taft Bridge and were created in 1906 by sculptor Ernest Bairstow, who also carved many of the sculptures on the Lincoln Memorial. 20. Woodward Condominiums, at 2311 Connecticut Ave NW, are a block of condos built in 1910 in the Spanish Colonial Revival style and was designed by architects Harding and Upman. 21. The Fuller House, at 2317 Ashmead Place NW, was the first house constructed on the newly subdivided Kalorama District in 1893. It was designed by its owner, Thomas Fuller, and is an early and important representation of the influence of the English Arts and Crafts Movement on residential architecture in the US. 22. The 2101 Connecticut Avenue Condominiums, at 2101 Connecticut Ave NW, is a housing co-op built in 1928 in the Spanish Colonial Revival style. The style, mostly found in California and Florida, was highlighted during the Panama-California Exposition of 1915 in San Diego, and was popular from then until about 1931. 23. 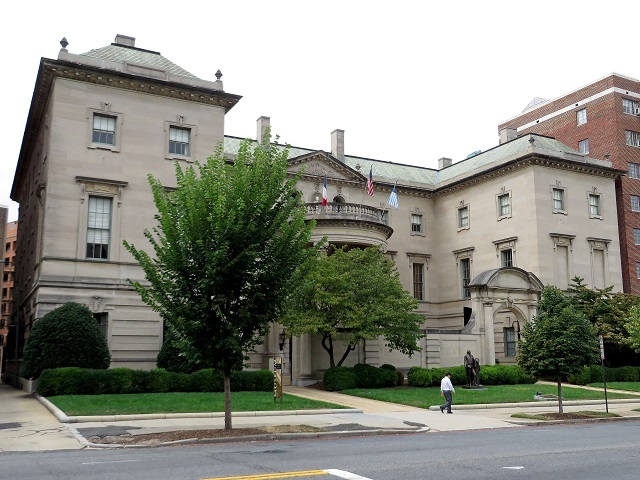 The Lothrop Mansion, at 2001 Connecticut Ave NW, is a Beaux-Arts style home designed by local architects Hornblower and Marshall for Alvin Mason Lothrop, one of the founders of the now-defunct Woodward & Lothrop chain of department stores, and was built in 1908 at a cost of $100,000. It currently serves as offices for the Russian Trade Representative. 24. 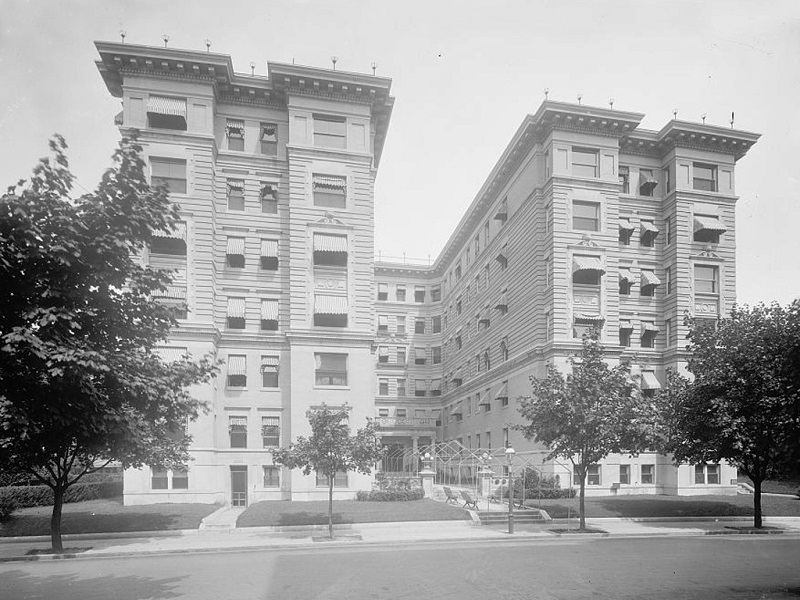 Brighton Apartments, at 2123 California St NW, appears in this photograph adapted from one on file in the Library of Congress dating around 1915. “The Brighton” was built in 1911 and was designed by Albert Beers for developer Henry Wardman. Beers’s work in Washington spanned 6 years from 1905-1911, within this six year time frame he designed more apartment buildings than any other architect. The Brighton is seven stories tall and, like many of Beers’s 1908-1909 designs, was planned in a U-Shape configuration. Sited in the fashionable Sheridan Kalorama neighborhood, the apartment was destined to become the home of the “The most distinguished public, military and naval officers” and was touted as “The home of the Army and Navy Set.” The Brighton offered furnished and unfurnished suites and provided a cafe and a large public reception room on the first floor. 25. The Churchill Hotel, at 1914 Connecticut Ave NW, was built in 1906 as an apartment building in the Beaux-Arts style, and later renovated into a hotel. 26. The McClellan Statue, an equestrian statue of Civil War General George B. McClellan, was approved by Congress in 1901. A competition for a sculptor was held, but the results were thrown out and the contract was awarded to a design by Frederick MacMonnies, a protégé of Augustus Saint-Gaudens, who was on the commission. The statue was dedicated May 2, 1907. 27. Wyoming Apartments, at 2022 Columbia Rd NW, is a Beaux-Arts style luxury apartment building designed by B. Stanley Simmons for Lester A. Barr. The building has two wings, one built in 1905, and the second in 1911. In 1982, Barr’s grandson sold the building for $6.3 million to developers, who converted it to condos. Notables such as Betty Friedan, Christopher Hitchens and Dwight D. Eisenhower have lived here. 28. The Fraser Mansion, at 1701 20th St NW, was designed by Hornblower and Marshall in an early eclectic Beaux-Arts style for New York merchant George S. Fraser in 1890 at a cost of $75,000, more than ten times the cost of a typical Washington home at that time. The building is currently the Church of Scientology’s National Affairs office. 29. The International Temple/Perry Belmont House, at 1618 New Hampshire Ave NW, is a Beaux-Arts style house built in 1906-9 for Perry Belmont, son of August Belmont and grandson of Matthew C. Perry, for $1.5 million. In 1919, Edward, Prince of Wales, was a guest of the Belmonts and awarded medals to American soldiers for their roles in World War I. The building is currently the headquarters for General Grand Chapter of the Order of the Eastern Star. 30. Richardsonian Rowhouses. This block of rowhouses on the 1700 block of Q Street was designed in the late 1880s by Thomas Franklin Schneider. Richardsonian Romanesque Revival architecture, named after architect Henry Hobson Richardson , incorporates 11th and 12th century southern French, Spanish and Italian Romanesque characteristics, and was common during the 1880s before the influence of Beaux-Arts styles. 31. The Clarence Moore House, at 1746 Massachusetts Ave NW, was built in 1909, in the Beaux-Arts style with a Louis XV-style exterior. Clarence Moore was a West Virginia coal magnate and only lived in the house until 1912, when he was one of the 1,517 passengers who perished during the sinking of the RMS Titanic. The house is currently the Embassy of Uzbekistan. 32. The Sulgrave Club, at 1801 Massachusetts Ave NW, was designed in 1900 by Frederick H. Brooke and is one of Washington’s first mansions in the Beaux-Arts style. Built for Herbert and Martha Wadsworth as a winter residence, the building was completed under the name of Wadsworth House. In 1918 the Wadsworths donated the mansion to the Red Cross, who sold it to Mabel Thorp Boardman and a group of women in 1932, for $125,000. The women renamed it the “Sulgrave Club”, a club intended for music, art and social gatherings. Notes on the individual sites are adapted from the National Register, Wikipedia, Call Box Restoration Project, and other sources. Photos are by the author, with the exceptions of the Everett House and the Lothrop Mansion, which are from Wikimedia Commons; and and the Brighton Apartments, which is from the Library of Congress. This entry was posted in Hiking, History, Photography and tagged Dupont, Dupont Circle, Kalorama, Rock Creek Park, Washington DC. Bookmark the permalink.